The Print? column on the main list indicates if a golfer is marked to print. Only golfers that have a check in this column will appear on reports. Golfers can be selected manually or automatically. Note: If you do not see a Print? column on your list, you are viewing a custom list which does not include this column. It will be impossible to tell which golfers are selected to print. To correct this problem, select a view that shows the Print? column or click the View menu and select Default View. To manually select or unselect a golfer to print, click the box in the Print? column. Or highlight the golfer and press the SPACEBAR to toggle the print selection. Use the mouse, Arrows, Page Up, or Page Down to scroll through the list of golfers. Or type the golfer's ID number or last name to move to a golfer. To mark all golfers to print, click the Tools menu and click Select ALL golfers to print. 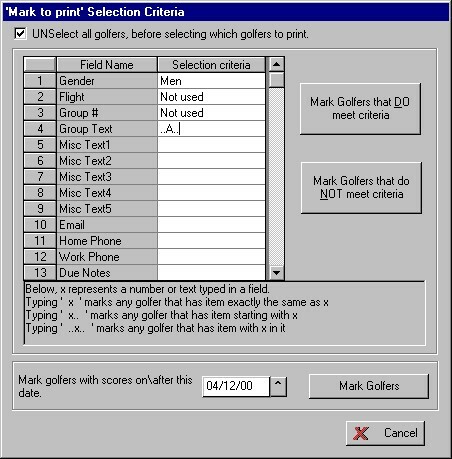 To mark all golfers NOT to print, click the Tools menu and click UNSelect ALL golfers to print. To mark golfers using a selection criteria, click the Tools menu and click Select to print using criteria. X represents a number or text. All criteria must match for a golfer to be selected. If you want golfers that have already been selected to remain selected you must remove (uncheck) the option UNSelect all golfers, before selecting which golfers to print. Example: The sample screen above will select any men in group A to print. Any golfers that do not meet this criteria will be unselected because the option UNSelect all golfers, before selecting which golfers to print is checked. To mark golfers with scores on\after a specific date, enter the "scores on\after this date" and click the button Mark Golfers.